Arms: Per chevron Vert and per pale Or and Ermine a chevron ermines in chief three estoiles of the second and in the dexter base a lion rampant Gules. Crest: An arm in armour embowed proper the hand also proper grasping a broken sword Argent hilt and pommel Or therefrom five drops of blood. Motto: Pro patria et religione. 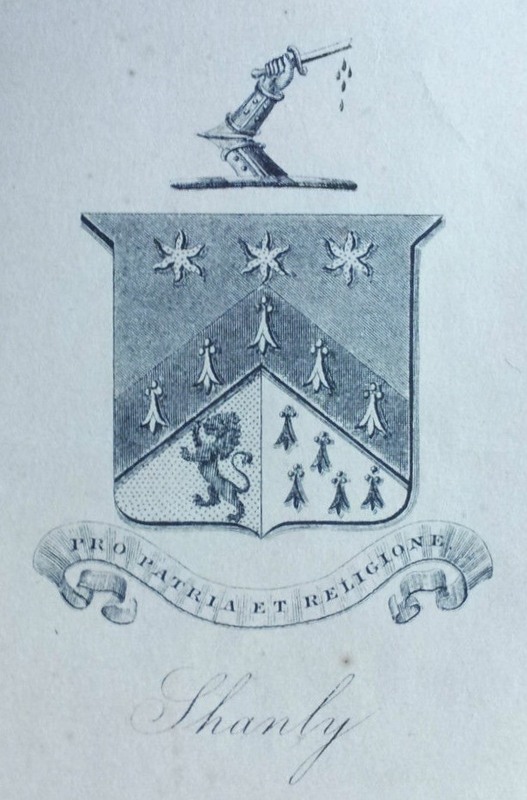 The name Shanly is not included in the three volumes that record Sir Augustus Wollaston Frank’s bequest of British & American bookplates to the British Museum.